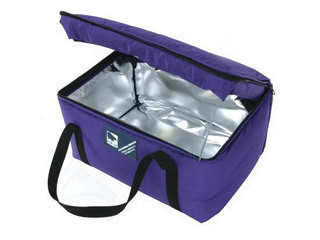 A 10 litre capacity thermal carry bag used for the delivery of temperature controlled products (hot or cold). Can be used with gel packs to extend thermal performance or if being opened and closed regularly. Often used by district medical staff when carrying out vaccinations within the community, or to courier pharmaceutical, medical, blood products or perishable samples between locations. Able to keep products within the required temperature range for several hours depending on use and whether gel packs are used. Also used for hot food delivery. Can be branded with organisation logo and colour. Can be supplied with trolley or document wallet as options. Cold life without opening: Over 24hrs, temperature increase at an approximate rate of 0.73?C/hr from 3.5?C at an ambient temperature of 30?C. All products are waterproof, have rot proof stitching and are antifungal. Specialist in pharmacy design, dispensary process flow, storage systems. Our consultants have over 40 years of experience and are ready to help you. Please provide us with your full contact details to request a callback or for product brochures to be emailed. Please provide your contact detail, our customer support will contact shortly to complete the order/request. Our popular modular Y-Series pharmacy system system is in use through-out the UK. Along side our standard cabinets, we can also manufacture bespoke cabinets to suit your individual requirements. Our cabinets are manufactured and in-use throughout the UK, pharmacy cabinets combine our standard medicine cabinets with a secure inner controlled drugs cabinet. Pharmacy fridges are required for the accurate storage of vaccines and pharmaceuticals at temperature between 2 and 8 °C. Our pharmacy fridges are protected by a warranty of 3-5 years with UK mainland. Designed for the UK healthcare industry our highly versatile Medi-Trays Trolleys are available in a range of sizes and configurations with a large selection of accessories to choose from. Our drug trolleys with lockable drawers can be manufactured to different sizes and drawer configurations to match your requirements. Chairs and stools, ergonomically designed utilise modern materials, combining smooth surfaces rounded corners and comfort, durability and ease of cleaning. The ‘Easi-Riser’ range of overbed tables are available with both standard and two-piece tilting tops and a choice of bases to suit different environments and patients ‘Easi-Riser’ range of overbed tables are available with both standard and two-piece tilting tops and a choice of bases to suit different environments and patient requirements.